This blog follows my climbing trips; based in the Forest of Dean , climbing in the nearby Wye Valley, North Wales, Scotland, Picos de Europa Spain and European Alps. Back from a very hot and sunny Picos De Europa and a great few days climbing in this fantastic area - Ben had only driven past these impressive mountains before and was keen to return to climbing amongst them. Fuente De seemd a good place to start, with the cable car top station within easy walking distance to some excellent mountain crags. There was such a queue we headed to Camaleno a quick Via Ferrata to blunt the frustration of waiting ( there is a new ticket number system in place ) eventually we got the uplift to the top station and easy access to Ajuila Oisteaochea and a good introduction to multi-pitch climbing for Ben. Next day we set off early for a walk in to the South face of Naranja de Bulnes and enjoyed a relaxed ascent of the Sur Direct to attain the summit and a multi-abseil descent. After a surprisingly quiet night in the JDU refuge ( which was pretty full ) we headed up to the East face of Naranja with the hope on doing the classic La Cepeda - it had been very busy the day before and we didn't want to end up queuing again, luckily it was empty and remained so all day, so we could relax and enjoy this fantastic route in perfect condition. Ben was keen to try out some ' sport ' climbing back up at La Vuelta, so to avoid the crowds we set off early to Fuente De and enjoyed this great little crag all to ourselves as a wind down to a successful trip - thanks Ben - a great few days in a fantastic mountain area. The weather has been very good to us lately with only the odd shower effecting an otherwise perfect start to the season - and there have been quite a few teams out making the most of it, with large contingents from Guildford MC, Dublin and Cardiff Uni. MC all enjoying the warm limestone. We've managed to find some peace and quiet away form the crowds with trips to Cleeve Hill, Wintours Leap, Symonds Yat and Wyndcliffe. One disappointment this season is the loss of Tintern Quarry as a sports climbing venue - the owner no longer wants climbers in the quarry - hopefully negotiations will continue and we can eventually make use of this excellent venue again. Patience with this unusual winter finally paid off with a fantastic week in the Cairngorms to finish off this season's courses. With a major thaw before last week and a return to colder temperatures, the conditions were far better, combined with blue skies and sunshine we enjoyed some of the best days out this season. There were surprisingly few teams out, adding a remote feeling to the 'alpine' atmosphere which was certainly appreciated by both Grahams, Tracey, Mauro, and Terry, and culminated with a spectacular day in the winter mountains for me to end the season on a high. Coire an-t Sneachda, only 40 mins from the car park, but a world away in atmosphere. The continuing stormy weather has given some pretty challenging conditions for the start of this seasons winter courses, either with too much snow in the Cairngorms or too little snow in Snowdonia. The crags are buried in masses of snow in the Cairngorms with attendant high avalanche risk and limited climbing options, but it has been a good opportunity to practice some of the skills - especially with the use of transceivers. Snowdonia has been a been a big disappointment after last year's fantastic conditions and although there has been some recent snowfalls, it has been too warm for climbing conditions to develop, however, with any luck the nearly established snowpack will improve with just a few degrees drop in temperature, fingers crossed as I've got quite a few courses lined up. 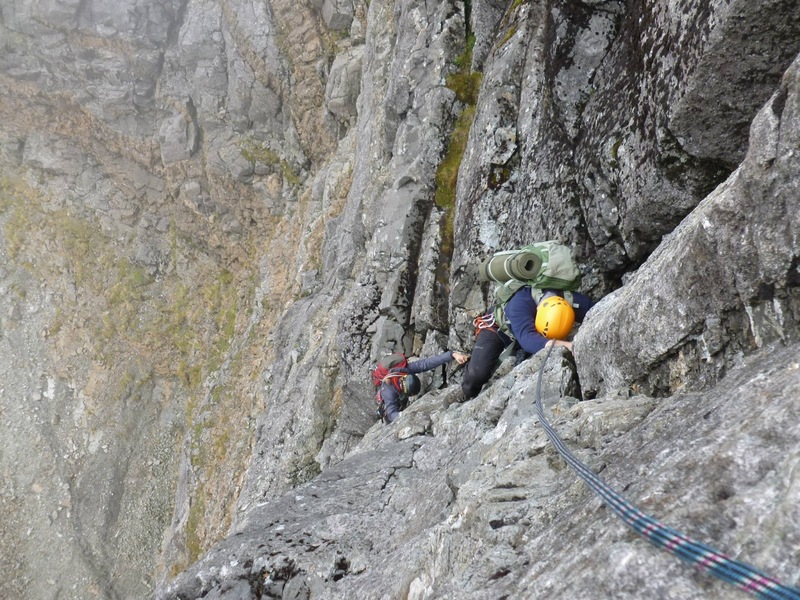 A long drive north in September for another attempt on the Cuillin for Russ, who was very keen to complete the traverse after an aborted attempt last July. We were joined by Kevin, who had done sections of the ridge before but had always had his sights on the complete traverse. So it was a pretty enthusiastic team, despite the uncertainty of the weather, that headed out from Glenbrittle in the dark early hours on Tuesday. We made good time to Gars Bheinn and were rewarded with a beautiful sunrise as we topped out, with the sun burning off the mists rolling in from the west. Everyone was in good form and the difficulties were ticked off fairly rapidly, although the TD gap slowed us down a bit even though it was dry and sunny. The mists started to close in again before we reached An Stac and our world contracted to just a few metres in front of us. Both Russ and Kevin had experienced this section of the ridge in better visibility and so weren't missing out too much, instead we concentrated on moving efficiently and safely on the now wet rock, without even breaking stride for the Inn Pinn. After collecting our stashed bivvi kit we carried on to our campsite below Sgurr Greadaidh and a well earned meal. A few glimpses of stars during the night suggested better things for our second day, but we awoke to a thick wetting mist and complete darkness. The poor conditions required a slow, deliberate approach over the complicated terrain of Greadaidh & Mhadaidh and it was a relief when daylight made progress easier over Bidein Druim nan Ramh. Kevin was very keen on attempting Naismith's Route on the Bhastier Tooth and with conditions improving we traversed in to the start. A loose block on the crux added an extra element of excitement, but despite a little hesitation we managed to reach the summit of Am Bhastier in good style. Sgurr nan Gillean is never an anti-climax, and after dropping off our heavy packs at the col, it was a enjoyable finish to the traverse. A great sense of achievement for the guys - they'd been waiting a long time to complete the traverse - and to do it in good style, in poor conditions heightened the feeling, especially after the congratulations from a couple of teams who aborted their attempt late on Tuesday. Well done guys! The fresh snow on Thursday gave the Cuillins an Alpine feel for Steve and Jim's introduction to the ridge on Friday and led to a genuine feeling of excitement for their attempt on the traverse. After stocking the camp, we had an early start on Saturday to allow for a steady pace, and we made good progress until the Inn Pinn - given it was a Bank Holiday and good weather, we shouldn't of been surprised by the number of people wanting to climb it, so we joined the que and waited our turn. We managed to get to our bivvi site and to enjoy a well earned meal before the weather deteriorated and we were tucked up warm and cosy during the worst of it. Another early start was rewarded with some splendid views and a fantastic feeling of having the Cuillins to ourselves - it was only near the end before we saw anyone else on the ridge. Some things are worth the effort and it was with a real sense of achievement that the guys finally stepped onto the summit of Sgurr Nan Gillean and the end of the adventure - well done guys! Just recovering from a late night return from the Alps today and taking a look through the photo's. I'd hoped to put a bit more into my camera work on this trip, but I was too tired to do anything but snap ! my climbing partner Rob, however, got some good shots. 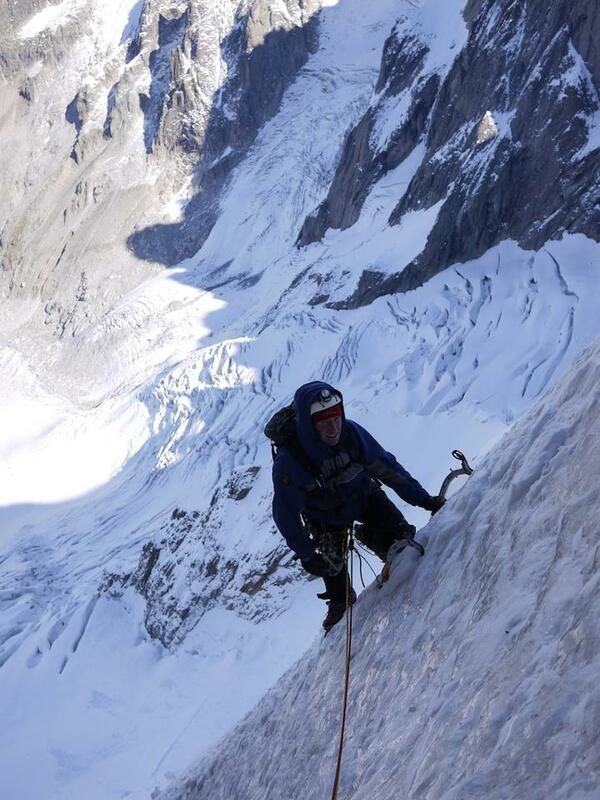 We were very lucky with a three day weather window to give us reasonable conditions for our route on the big north face of the Grande Jorasses. We made good progress on the moon lit approach through the deep crevasses of the Mont Maller glacier to below the Petite Macintyre, and we were well established on the ice by the time the sun was picking out the summits. The route was long and tiring with burning calf muscles after 8 hours of front pointing, and although I wanted to descend the Hirondelles Ridge to get back to the hut, we decided to abseil back down the route - a good decision in the end as we were able to follow our tracks back through the crevasses and avoid the stress of unknown ground after a long and tiring day. alec roberts. Picture Window theme. Theme images by AndrzejStajer. Powered by Blogger.